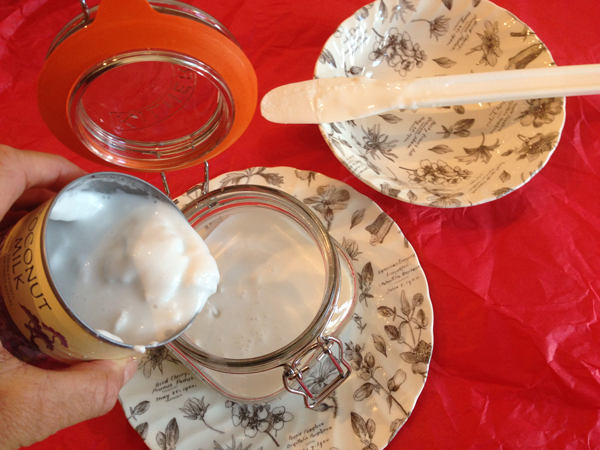 » Milk Kefir – Let’s Make it Right now! Milk Kefir – Let’s Make it Right now! So we’re ready to start making your first kefir milk. Woo hoo! We’re going to keep this super quick. And super simple! Bacteria eat the lactose (sugars) in regular milk during fermentation. That’s why kefir milk is almost lactose free once it’s ready. Lactose free milk contains a different type of sugar in the form of lactase, which is added to lactose free milk to make is taste sweeter. To de-activate the lactase enzyme, the milk is then highly pasteurised (a more intense process than that used for regular milk) which also gives it a longer shelf life. I haven’t tried using this milk, but I’ve read that ‘it’s worth a try’ and could be successful. For today I’m using the milks below, but please just grab your favourite milk and try with that. I haven’t made them all myself to date, but I’ve just bought rice/soya/hazelnut and almond (shop bought) to try them out for you .. and will report back when I’ve experimented! Take your can of milk and give it a jolly good shake. Take a small glass/cup and pour a little of your milk into it. Follow the instructions from your kefir culture starter box and blend the start into the milk with a teaspoon (you don’t HAVE to do this, but I just think it’s good to mix it in). Don’t you just love a sound effect. Next, pour your blended mixture into the clamp down jar. Pour the cup of milk in next. Stir with a long spoon, shut the lid, clamp it down and move it to a warm space. Keep an eye on the jar (oh alright, not ALL the time 😉 and in 24-48 hours (usually 48 I find, for coconut kefir) your milk will be ready. Oh, I’m sorry. Did I make that too easy? Hmmmmm. Let me try to complicate things so I can look uber clever. If you read that a clamp down jar won’t work for fermenting kefir, please know that it will work brilliantly. They’re easy to source, cheap to buy and this is the only style of vessel I’ve used to date. You may read elsewhere that you can make kefir in an oxygenated environment (open jar covered with muslim) .. That simply encourages mould and there’s no need to make your life more difficult. Trust me. Clamp downs are dreamy-easy! I haven’t used airlock jars to date. It means buying a different lid. Again, there are some who say they’re essential to many ferments. To be honest, I now can’t remember which ferments. But I’ve been fermenting milk, fruit AND veg for a year now and have found glass, clamp down jars to be just the ticket. It’s said that they can help to prevent mould forming – although I have only seen mould if I’ve seriously neglected a ferment – and some people believe it can make the ferment taste better, but others are firm fans of canning/mason jars or clamp down jars. It all seems to be a subject of healthy ongoing debate! Who knows though, maybe one day, both you and I will fall in love. Awww. Won’t that be cute? I’m getting distracted! Back to milk. Yay! Some manufacturer’s instructions will advise you to heat the milk to a certain temperature before fermenting it. I use mine at room temperature, whatever that is at the time I’m making milk. We don’t live in a tent, so it’s pretty warm 😉 .. I’ve even used it straight from the fridge. Naughtyyyy! In truth, it’s a good way to confirm that there is no rule that works for all. I’ve happily made ferments in a particular way for months before reading somewhere that my successful method never works. This is the amazing and exciting thing about fermentation. Following instructions the first time is like slipping on your favourite onesie. (No, I don’t have one. I’m just not cool enough 😉 It’s cosy. And it feels safe. However …. after you’ve found your way, allow ‘challenge’ to be your friend. She’ll dare you to break ‘the rules.’ Drag you down a road less familiar. Tempt you to try things your own way. Gosh. Where was I? Distracted again by the many faces of fermentation. So your milk and powder are blended. Next, pour your blended mixture into the large jar. Onto the next milk then! With this baby you start with the kefir grains. Pop them gently into the bottom of your clamp down jar. Pour in the milk. Stir. Shut the lid, clamp it down (leave in warm place, blah blah, see above) and 12-24 hours later your milk will be ready. Grains can make less sour milk for the first few ferments. It’s the luck of the grains you receive and how they’ve travelled (who knows? maybe that bus journey was rocky) but I seem to remember that mine were fine from batch two. When your ferment is ready, you need to take a jar with a sieve resting on top. Pour in your milk and gently stir it until the milk drains through to the jug and the grains remain. Pop those in a new jar and start your process again. Grains are pretty hardy, but they can be broken up with a spoon, so you want to treat them with love (even kefir grains like love 🙂 because you’re going to be looking for them to thrive and multiply. Eventually they will clump together and start to look like little chemistry experiments. Aliens from Planet Kefir. Mine are getting quite sizey now. It’s fascinating to see them morph. Add the relevant volume of powder – to volume of milk – into a glass. I use 1 packet of culture powder to 1 quart/2 pints milk, but it will depend on the brand you choose. Stir in a little milk with a spoon, so the two are blended nicely. Take your clamp down jar and pour in the milk. Add the powder culture/milk to the jar. Stir with a long spoon. Close the lid and clamp it down. Move the jar to a warm spot (around 68-75% is good – cooler will slow the fermentation time a little, wearer will speed it up, but that’s okay; you just need to be prepared). Keep an eye on the milk so it doesn’t curdle. Once the milk separates from the whey (curds and whey) it will look messy, is still drinkable (you can pop it in a blender and redeem it) but it will be more sour. Too tangy may be too much, which is why it’s best to catch it before it curdles. Once ready, keep in this vessel and refrigerate. Or transfer to a jug (see the ones I use, which are perfect for our fridge door). To make your next batch, keep back 6 tablespoons to use for your next 2 pints/quart milk. Grab a clean jar, add fresh coconut milk and the 6 tablespoons of milk from your previous batch. That’s it. It’s a repeating cycle until the bacteria pack up and stop fermenting your milk. Take your clamp down jar and add the kefir grains. Shut the lid and clamp it down. Move the jar to a warm spot (around 68-75% is good – cooler will slow the fermentation time a little, warmer will speed it up, but that’s okay; you just need to be prepared). Once ready, take a jug with a sieve resting on top. Pour your milk into the sieve. Gently stir the milk, allowing the milk to strain into the jar, leaving your grains in the sieve. Transfer the grains to a clean jar and repeat the process to make a new batch of milk. Refrigerate your kefir milk in a jar. Or a jug (see the ones I use, which are perfect for our fridge door). So that’s it my lovely. We’re in business. I’m drinking kefir. You’re drinking kefir. There remains only one thing to say. My pleasure Debbie! Great news that it’s igniting your interest! Please read the post about One Man’s Story, published on Sat 8th November. Stephen, who’s story it is, has added to the comments about kefir and the astonishing results he has experienced in a very short time! Really enjoying your kefir series and I have a couple of questions, please. I notice you say you drink your kefir – do you mean literally? I’ve used a local farm shop (organic) one and substitute it for yogurt on a bowl of nuts, seeds and berries, which is yummy but wondered whether your home-made version is runny enough to actually drink. I notice you had quite a lot in your fridge in the photo, presumably you’d been working your little grains overtime – poor things! But seriously, how much do you drink a day? What’s a good measure to ensure you get the benefits of the wonderful bacteria? Secondly, how do you tell when your ferment is ready? Does it stop bubbling, or perhaps it’s thickness which is the key? Being a complete newbie to this idea of making my own, I’ve got this awful vision of it fermenting away by itself and that when I check on it, it’s escaped the jar and is seeping around like “Quatermass” or else the jar has exploded open from the build up of pressure. (I think I’m remembering my grandfather’s homemade ginger beer which used to regularly pop their corks!!!!) The kefir process is presumably far more gentle and less vigorous but it still concerns me slightly! To answer your first question, yes, my home-made kefir is runny enough to drink. I have found the cow’s milk to be thinner than the coconut. The coconut (seasonally, this changes – it seems to turn out thickest in summer) can, once in the fridge, form a lovely thick cream on top. When this happens, you can see the watery whey below. It’s almost like the whole jug has turned to thick cream, but it’s deceiving! When this happens, I use a long beer brewing spoon to push through the cream (it can be really thick and has to be done carefully) and then stir everything back into together. It’s then a lovely, thick consistency, will pour beautifully and is absolutely perfect for cereals or to pour over a mix of nuts/seeds/berries etc. I did what you do, by replacing yoghurt with kefir. I still love yoghurt. Both have their place. But kefir is known to contain more probiotics, so I like to get a daily fix! I make the coconut milk with powder (it’s easier than refreshing grains in milk regularly – and although the grains are supposed to contain more strains of bacteria than the powder, the powder is all I’ve used for my own milk since the start and they’ve done me proud, so I’m happy with them). I use cow’s milk with grains. I’ve not finished this series yet. There is so much to cover that I’m going to keep on writing posts so that by the end of it, hopefully you will have enough photos and instructions to help you through all the troubleshooting as well. Stick with me and I’ll go through everything I know in detail. Moving onto ‘how much do you drink a day?’ I would suggest starting slowly. A tablespoon at first. Just off the spoon. Or if you find it a little sour, add a teeny drop of honey and mix it in. I found it took me around 9 months to be completely happy with coconut kefir without any honey. I just had SUCH a sweet tooth. Now I find it sweet, where you may notice the tangy edge to it. You’ll be amazed at how your tastebuds will change! When I first tried it, my tummy gurgled a little straight afterwards and I felt it working away, processing what was going on! It wasn’t uncomfortable and because I know they’re probiotics doing their work, I was just smiling away thinking ‘Good JOB. Go do your work babies!’ Haha. Next day I had 2 spoons. Within 3 or 4 days I ramped it up to a bowl of cereal with plenty of kefir and the gurgling stopped. I just loved knowing that it was working. It was like my body was telling me something good was happening! I’m not a medic and therefore not qualified to give advice, but I did find taking probiotic pills had no positive effect on my body at all. I took one a day for 9 months to no avail. I ditched it when I started on kefir and the effect was so quick. I just stopped getting any flus/viruses etc and also .. intense pain in my knees disappeared and remains that way, so long as I stay on the drink. Each person needs to do what’s best for them. I doubt a doctor will give you advice on this. The evidence is mostly in people’s own stories of being healed/keeping well. Scientific research (listed on my Main Menu and in the post ‘What is Kefir?’) detail some of the those stories. But it’s people taking their own health into their own hands and going on-line to talk about how they’ve benefitted, that is the real truth of it. Ultimately, probiotics are a healing thing, so you may expect to experience a reaction of some sort. Remember that you are feeding the body with bacteria that will be rallying around to try to protect you from future germs and fight any existing pathogens (the bad bacteria). Bad bacteria are pretty toxic things any healing process we put our bodies through (fasting, cleansing, adding fermented foods) changes our body chemistry in some way, so just be aware and take it slowly. Variety of bacteria is good. I will cover that too. Kefir is my first love. All I did the first winter was drink that and eat some fermented vegetables. Cucumber pickles and mixed veg. A ferment can be ready any-time after 12 hrs. Prob cow’s milk is around 12. Sometimes 25. Coconut kefir 24-48. I find it’s usually 48. Sometimes 36 if the room is very hot. I’ll cover this and what happens when it goes too far in the next couple of weeks. With food, you can ferment porridge for 12 hours. Or more. Vegetables can often take 24 hrs – 3 days. Or a week. Or 8 weeks. Or more! Savoury miso can take up to 2 years! It all depends how you ferment them and what you’re fermenting. I’ll cover all of this as I experiment at home and share what I’ve already done. It’s just about watching and tasting. The water will change to mildly carbonated. It’s very subtle, but it’s there. The vegetables change in consistency. They smell different. Sometimes they can smell awful after 3 days. If they do, I shut the lid and leave them another 3. It usually settles. And finally, some ferments can bubble over! Kefir has ONCE with me, but only because I filled the jar too full. It didn’t explode or do anything crazy. It was just a little messy clearing up the spillage! Usually it doesn’t do that as I only fill the milk to the foot of the neck of the jar. As I say, so much to cover. Will keep feeding the blog with posts and hope they eventually answer all your questions! Ask away any-time. Here to help wherever I can.